3 years is all it has taken for Sandals LaSource to redefine the hospitality industry in Grenada, and stamp its mark on the economic revival the country has experienced in recent times. As LaSource celebrates its 3rd anniversary on 27 April, it has not been an easy ride. However it was one that the award-winning chain has turned into great success. Only recently Sandals LaSource achieved the Gold Badge from the US News & World Report 2017. In fact, LaSource Grenada has been such an overwhelming success, that it led to Sandals developing it as a separate brand within the chain, with plans to construct a Sandals LaSource St Lucia in the near future. Unbridled luxury and unique innovations such as its Infinity Sky Pools and Rondoval Swim-up suites are what makes LaSource Grenada the premium product in the all-included niche. At Sandals the philosophy has always been that a rising tide lifts all boats. And so the spin-off benefits created by the linkages Sandals has developed with local suppliers and producers has been significant. Whether it’s the tour operators, taxi drivers, farmers, craft operators or entertainers, Sandals impact goes well beyond the team members it employs. The simple fact is that Sandals drives economic growth throughout the sector. Just ask Sir Royston Hopkin, owner of Spice Island Beach resort who has publically expressed commendations to the resort. One would have thought that Sir Royston would have opposed the arrival of Gordon ‘Butch’ Stewart’s flourishing hotel chain in Grenada. Rather Sir Royston embraced it and has indeed reaped significant rewards as a result of Sandals’ presence on the island. The Government of Grenada has also recognised the impact Sandals has had in areas such as increased airlift, with the addition of Jet Blue and more American Airlines flights since the arrival of the World’s Best All Inclusive hotel, an award Sandals has copped for the past 23 consecutive years, from the World Travel Awards. 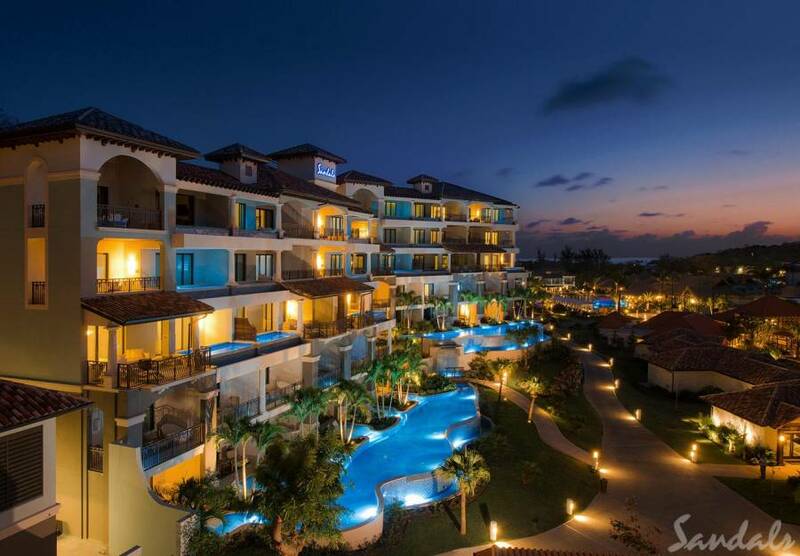 More than that, with traditional markets in Europe waning in recent times and following the fallout from Brexit, Sandals has opened the portal to the profitable North American market. According to Sandals Deputy Chairman and Chief Executive Officer Adam Stewart, ‘there’s a Sandals ad running on a major network in North America every 30 seconds’. And so the marketing giant that is Sandals Resorts has contributed significantly to raising the awareness of Destination Grenada. 82% of the North American market knows who Sandals is, the only company that comes close to that is Secrets with 20%. Sandals have invested in a highly trained and driven sales team worldwide that is on the road 365-days-a-year promoting locations in the Caribbean. Wrapped cars can be seen in several major cities while banners and posters adorn travel agencies from North America to Europe. It is a level of marketing that many islands concede they simply cannot rival. That market awareness means that many of the visitors who board the planes Sandals attracts do not necessarily go to Sandals LaSource. Many go to the smaller hotels and guest houses, further deepening Sandals economic impact. The advent of Sandals in Grenada has also had a positive effect on human resource development on the island, as Sandals has done in every island that it calls home. Sandals’ Hospitality Training Programme caters to young persons interested in making tourism a career, and Sandals has helped many of Grenada’s youth along that path. Furthermore, the company has created an avenue for its team members to further develop their skills and talents through its Sandals Corporate University. The SCU offers over 200 accreditation courses as well as scholarships that allow team members to pursue tertiary education up to the Masters and Doctoral levels. Recognising the fact that as a Caribbean-bred company it has a responsibility to the communities and countries where it operates, Sandals is serious about giving back, which led to the birth of the Sandals Foundation, the resort’s philanthropic arm. The Foundation has played an important role in helping to improve literacy in Grenada, distributing over 50,000 brand new books within Grenada in its first 3 years. The community has also benefitted from its massive annual Christmas toy drive; environmental awareness initiatives in the fight against the invasive lionfish; tree planting initiatives and its recently launched “Women in Agriculture” program with Grenrop. Sandals also provides funding for the Sweet Water Foundation for victims of sexual abuse in Grenada. The great news for the industry is that when Sandals brings a guest to Grenada, they just keep coming back. “The formula is simple, we need to attract guests then keep them coming back. Our average returning guest rate at Sandals LaSource is 40%, which is relatively low in comparison to other Sandals Resorts, but you must remember we have only been here for 3 years, so we are still new in comparison and haven’t had as much time to capture as many hearts. Improving the returning guest rate is a focal point for us,” remarked General Manager, Peter Fraser. It’s been a prosperous and exciting relationship over the years, and Sandals has expressed its commitment to deepen and enhance its presence in Grenada. 2017 is pregnant with promise and is likely to be a watershed year for that relationship. The buzz of excitement is already enveloping team members throughout the island and is expected to spread throughout Grenada as the resort forges ahead with its plans for the future.